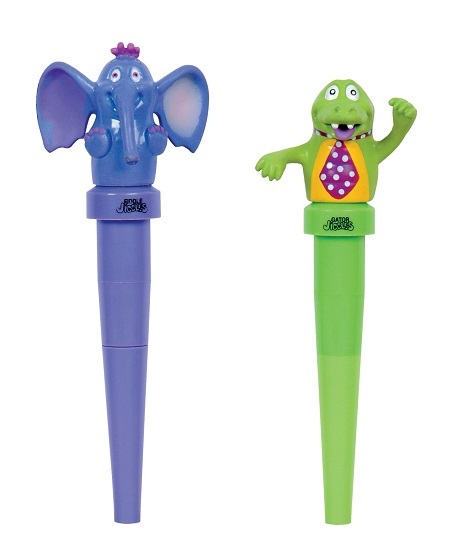 Jigglers Massager Elephant and Gator Chewable Oral Massager can be used for calming and organizing input of low-intensity vibration. Jigglers are the only continuous "on" chewable and durable oral facial massager. This dynamic duo of Gator and Elephant is popular with parents. Simply install one "AA" battery (not included) and give the head a twist. Use of this product requires adult supervision at all times. The elephant's ears are great as a spoon for orally defensive children. Abilitations Integrations. Comes as a set of 2 Ideal for special needs therapy and oral stimulation Provides a calming massage vibration for the face and mouth. Adult supervision recommended.